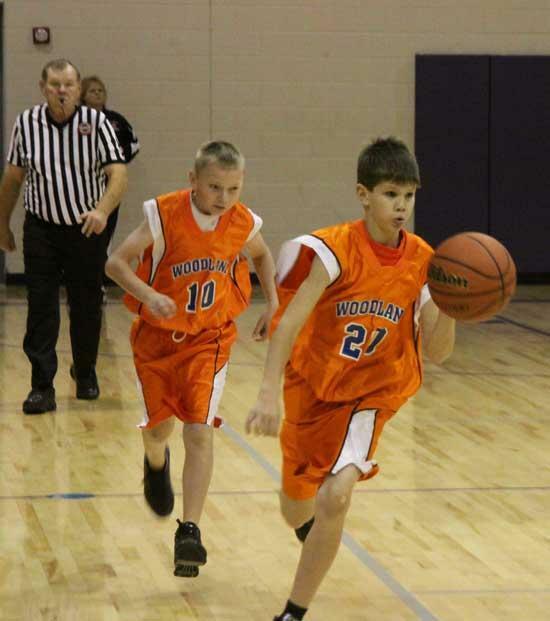 Woodland’s Fletcher Moore dribbles down the court as Austin Spry, 10, follows. Auburn's girls and Woodland's boys captured championship titles in the first Border War Basketball Tournament played at Woodbury Grammar Saturday. The preseason tournament drew teams from seven different schools and served as a prelude to the regular season, which opens Monday for Cannon County's six grammar schools. Woodland's boys and girls provided their fans reason to get excited about the 2010-11 season as both teams reached Saturday's championship games. Erin McReynolds scored 23 points to power Auburn to the Girls Border War Championship with a 37-27 win against Woodland. McReynolds' two 3-pointers in the second quarter - her only treys of the game - enabled Woodland to pad its early lead to 21-14 and Auburn was never able to overcome it. Kristen McReynolds, Paige Tenpenny and Cheyenne Fann each scored four points in Auburn's winning effort. Ariana Kailiponi led Woodland with 14 points, and Hannah Faulkner added nine points on the strength of three 3-pointers. Auburn jumped out to an 11-8 lead after the first quarter when McReynolds established herself and team with seven points. She had 15 of her 23 at the half. Woodland was held to just two field goals in the second quarter as Auburn's defense stiffened. Woodland stayed within striking distance but could never sustain a run to seriously threaten Auburn. The boys championship game offered little suspense as Woodland had its way with West Side in a convincing 42-13 thrashing. Josh Ruehlen and Jackson Mason led Woodland's championship effort with 13 and 12 points, respectively. AJ Daniel added six points with two first-half 3-pointers that helped seperate the teams. Jacob Nave led West Side with five of the team's 13 points. Collin Anderson added four points for West Side. West Side kept it close in the first quarter but Daniel and Ruehlen finished the frame with back-to-back 3-pointers to stretch Woodland's lead from 7-6 to 13-6. From there it was all Woodland, which finished the game on a 35-7 run. Woodland used a 14-3 second-quarter blitz to open a 26-9 lead that proved more than enough as West Side struggled from the field. Kaylee Hayes, Woodbury Grammar; Paige Tenpenny, Auburn; Cydney McPeak, Woodland; Sarah Hunt, Woodbury Grammar; Erin McReynolds, Auburn; Ariana Kailiponi, Woodland; Kristen McReynolds, Auburn; and Hannah Faulkner, Woodland. AJ Daniel, Woodland; Josh Ruehlen, Woodland; Bo Bryson, Woodland; Jackson Mason, Woodland; Jake Burdick, West Side; Jacob Nave, West Side; Briar Jakes, Auburn; and Garrett McReynolds, Auburn. glad to see all c'ship games were played by county teams. way to go auburn, we are all proud of you! Congratulations everyone, WAY TO GO LADY KNIGHTS! You are some wonderful girls and we are proud of you! Great games and great sportsmanship from all teams. Way to go Lady Knights--you are a great group of girls! Boys--hang in there--you played great too!